The United States warned Moscow it was on a “dark path” to isolation on Wednesday after Russian troops stormed Ukraine’s naval headquarters in the Crimean port of Sevastopol and raised their flag. The dramatic seizure came as Russia and the West dug in for a long confrontation over Moscow’s annexation of Crimea, with the United States and Europe groping for ways to increase pressure on a defiant Russian President Vladimir Putin. “As long as Russia continues on this dark path, they will face increasing political and economic isolation,” said U.S. Vice President Joe Biden, referring to reports of armed attacks against Ukrainian military personnel in Crimea. Biden was in the Lithuanian capital Vilnius, part of a quick trip to reassure Baltic allies worried about what an emboldened Russia might mean for their nations. Lithuania, along with Estonia and Latvia, are NATO members. “There is an attempt, using brutal force, to redraw borders of the European states and to destroy the post-war architecture of Europe,” Lithuanian President Dalia Grybauskaite said. United Nations chief Ban Ki-moon meets Putin in Moscow on Thursday and travels to Kiev on Friday. He will urge a peaceful end to a crisis that began when Ukraine’s president abandoned a trade pact with the European Union and turned instead to Moscow, prompting violent street protests that led to his overthrow. Russian lawmakers raced to ratify a treaty making Crimea part of Russia by the end of the week, despite threats of further sanctions from Washington and Brussels. 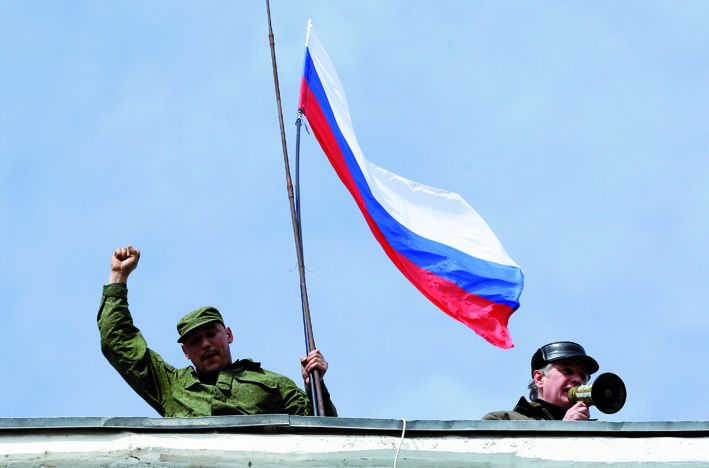 The Russian military moved swiftly to neutralise any threat of armed resistance in Crimea. “This morning they stormed the compound. They cut the gates open, but I heard no shooting,” said Oleksander Balanyuk, a captain in the navy, walking out of the compound in his uniform and carrying his belongings. “This thing should have been solved politically. Now all I can do is stand here at the gate. There is nothing else I can do,” he told Reuters, appearing ashamed and downcast. Ukrainian military spokesman Vladislav Seleznyov said the commander of the Ukrainian navy, Admira Serhiy Haiduk, was driven away by what appeared to be Russian special forces. In Washington, the White House condemned Russian moves to seize Ukrainian military installations, saying they are creating a dangerous situation. NATO accused Russia of trying to “redraw the map of Europe”. Russia sent thousands of soldiers to Crimea in the buildup to a weekend referendum in which the Russian-majority region voted overwhelmingly to leave Ukraine and join Moscow, reflecting national loyalties and hopes of higher wages. But there is unease among pro-Ukrainian Crimeans who have complained about the heavy armed presence across the region. A few hundred metres away, the local authorities attached new, Russian letters spelling “State Council of the Crimean Republic” on the building of the local assembly. Ukrainian security chief Andriy Parubiy said the Kiev government would urge the United Nations to declare Crimea a demilitarised zone. “The Ukrainian government will immediately appeal to the United Nations to recognise Crimea as a demilitarised zone and take necessary measures for Russian forces to leave Crimea and prepare conditions for re-deployment of Ukrainian forces,” Parubiy said. Ukraine announced plans to introduce visas for Russians, and Russia said it might respond in kind. Putin said his move to annex Crimea was justified by “fascists” in Kiev who overthrew pro-Moscowpresident Viktor Yanukovich last month. Ukraine and Western governments have dismissed the referendum as a sham, and say there is no justification for Putin’s actions. Germany’s cabinet approved EU plans for closer political cooperation with Ukraine, a government source said, clearing the way for Chancellor Angela Merkel to sign part of a so-called association agreement at an EU summit later this week. The 28-member bloc is expected to sign a more far-reaching trade accord with Ukraine later. But maintaining aggressive rhetoric reminiscent of the Cold War, Russia accused Western states of violating a pledge to respect Ukraine’s sovereignty and political independence under a 1994 security assurance agreement, saying they had “indulged a coup d’etat” that ousted Yanukovich. Moscow, which has said it will retaliate for so far largely symbolic Western sanctions targeting Russian officials, announced on Wednesday it was closing its military facilities to a European security watchdog for the rest of the year. The Russian Defence Ministry was quoted as saying the signatories of a 2011 Organisation for Security and Cooperation in Europe agreement had exhausted their quotas to inspect Russian military facilities and a planned inspection in the coming days would be the last. Biden said in Warsaw on Tuesday the United States may run more ground and naval military exercises to help Baltic states near Russia beef up their capacity after what he called Putin’s “land grab” in Ukraine. The Truxtun, a US guided-missile destroyer, started a one-day military exercise with the Bulgarian and Romanian navies in the Black Sea on Wednesday, a US Naval Forces official said. Washington and Brussels said further sanctions would follow the visa bans and asset freezes imposed so far on a handful of Russian and Crimean officials, drawing derision from Moscow. On a visit to Japan, which has joined the Western chorus of condemnation of Moscow’s action, close Putin ally Igor Sechin, CEO of Russian oil major Rosneft, said expanding sanctions would only aggravate the crisis. European Union leaders will consider widening the number of people targeted by personal sanctions when they meet on Thursday and Friday, diplomats said, as well as signing the political part of an association agreement with Ukraine’s interim government. EU officials say they have identified more than 100 potential targets. Some media reports say Sechin and the head of Russian gas monopoly Gazprom are on the wider list.